Join us 5-8pm at Redhook Brewlab on Captiol Hill to meet the makers of El Sonido. We will have a whole handful of VIPs that you can grab a beer and chat with including KEXP's DJ Chilly, SMASH President Ian Moore, Seattle Illustrator and El Sonido package designer Victor Melendez and Innovation Brewer Nick Crandall. Victor will be handing out limited El Sonido poster prints and El Sonido cans will be $4 all day long. You won't want to miss this one. Redhook Brewlab is at 714 E Pike Street, Seattle WA 98122 and all ages are welcome to this kick off shindig! Tony V's Garage is opening up their doors to celebrate this crisp mexican lager with live music and cans of El Sondio available to sip on. Head over there at 7pm to grab a pint, meet and greet with SMASH (Seattle Musicians Access to Sustainable Healthcare) and jam out. Tony V's has always supported local musicians and are taking it to the next level by serving up pints of El Sonido to directly support SMASH. Hit The Swiss 5-8PM to get yourself a pint of El Sonido and support local musicians. SMASH (Seattle Musicians Access to Sustainable Healthcare) will be there to share all they do for musicians in our community and we'll have a DJ spinning fun beats from 6-8PM. We're looking forward to launching our new brew in this historic spot in Tacoma! The Swiss is at 1904 South Jefferson, Tacoma WA and minors are welcome until 8:30pm daily! 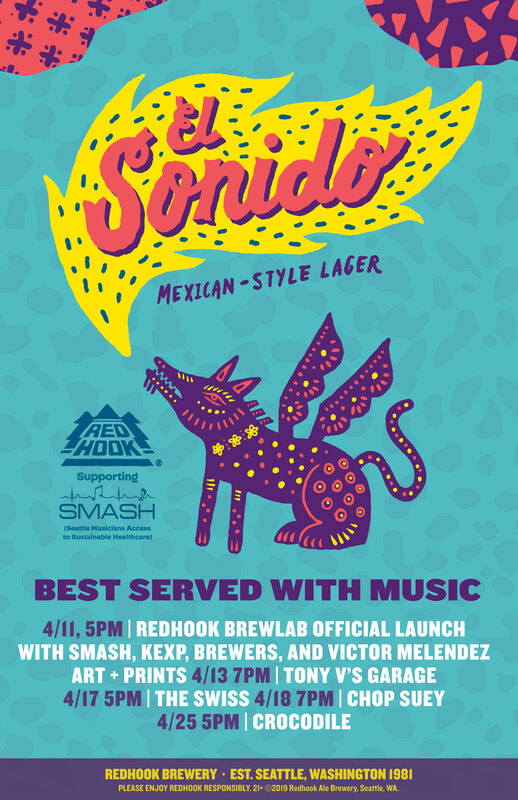 Hit the iconic Crocodile in Belltown for happy hour from 5-8PM for a pint of El Sonido and to support SMASH (Seattle Musicians Access to Sustainable Healthcare). The Crocodile is excited to support SMASH during this happy hour and benefit them with our new core beer! Hear KEXP's DJ Chilly while he plays a set of upbeat tunes and go home with some cool El Sonido swag.